Our resident twitter reviewer Tim Schilling is back with another tweet by tweet review looking at the next movie in the Puppet Master series: Puppet Master 2. This was the first of the series I saw at a very young age and the weirdness of the film has grown on me over the years. But..is the film too weird for Tim or does the bizarre nature of this sequel still hold some appeal? 0:02 Is there actually a story/any continuity to this one? 0:08 I don’t get why ghost hunters are in the hotel… There were like 3 survivors that saw killer puppets. Not ghosts! 0:21 Okay so there’s some kind of story to this one… I think. 0:24 What would a ghost hunter REALLY think of if they saw a possessed puppet run across their monitor? 0:28 That guy with the face mask thing was terrifying. 0:36 Why would the puppets even waste their time killing these rednecks? 0:38 Oh I see, there was an actual story going on so they needed to kill the rednecks. 0:48 Whatever plot this established in the beginning is long gone now, I have no idea what’s going on. 1:00 These movies are very forgettable. I can’t follow a thing that’s going on. 1:10 Everyone is dying the same way… By that puppet that lights people on fire. 1:11 Gross you can put your mask back on. 1:17 What’s with the green blood in this series? 1:20 What the heck was that creepy life size puppet woman thing!? I’m sure I would know what it was if this story made any sense AT ALL. 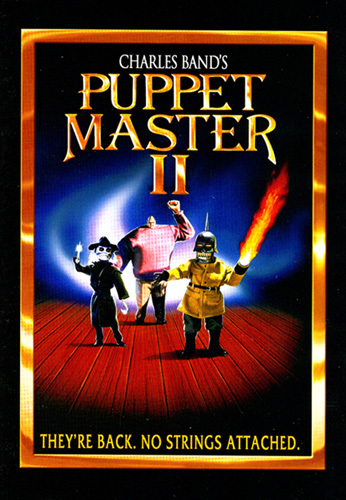 Like the first one, #PuppetMaster2 made no sense at all. Whatever was there for a story was changing every five minutes by something that was even more confusing. Also, the puppets were lame compared to the first. They weren’t even funny!